Clockwork Scarab, by Colleen Gleason (book review) – the Misses Stoker and Holmes, on the case! London society’s fairest maidens are being kidnapped…and worse! It’s Evalina who inherited the Stoker family call to hunt vampires and the superhuman quickness needed to succeed. The logical mind and innate problem-solving skills shared by Sherlock and Mycroft also live on in gadget-loving Mina. Only the personal request of Her Highness could make these rivals work together in this 1889 world powered by steam… and lies. Add a handsome police detective, a young man of the streets who knows more than he should, and a stranger who claims to come from the future (where electricity is legal? Oh, who is he trying to fool? ), and things get more complicated than either independent-minded miss had anticipated! Check out the first Stoker & Holmes book today at your favorite local library or independent bookstore, and immerse yourself in a steampunk city with mystery and mayhem. Or should modern writers not take classic tales beyond their original authors’ limits? 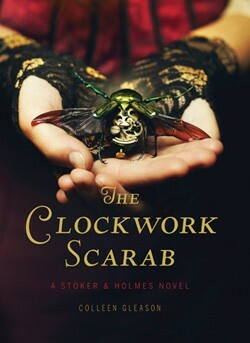 Book info: The Clockwork Scarab (Stoker & Holmes, book 1) / Colleen Gleason. Chronicle Books, 2013. 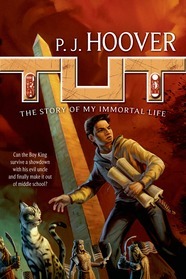 [author site] [publisher site] [book trailer] Review copy and cover image courtesy of the publisher. My book talk: When young London society heiresses go missing and leave scarab amulets behind, Stoker and Holmes must investigate – that’s Eva Stoker, vampire hunter, and Mina Holmes, niece of Sherlock. Summoned by the Princess of Wales to solve the deadly mystery, the two young ladies find another dead girl in the British Museum’s Egyptian room – and a young man in strange garb who claims to come from the future! Can Eva’s defensive talents keep rational Mina from becoming the scarab cult’s next victim? Can Mina solve the scarab mystery before Eva’s impulsive actions close off all clues or get them both killed? Can they get Dylan back to his time in his own world?